A view from the cycle path: A "mammoth school run"
The Cambridge Evening News today has a story about a fourteen year old secondary school student who has missed school for six months and whose parents are now moving house because the council insisted that he travel to a school 7 miles ( 11 km ) away. This, according to the paper, is a "nightmare journey". His father said the daily trip "including a taxi ride to the nearest bus stop, an hour-long bus journey and a 15-minute walk to the school" was too much. It apparently took 75 minutes all added together. Earlier in the year there was another story about school transport near Cambridge. In this case about children being expected to make their own way to a secondary school which is less than 3 miles (4.5 km) from their home. There were protests from parents when the council suggested that children should make this journey by walking or cycling instead of by taking a school bus. I have some sympathies. While the distances in both cases are short, I know the area and I wouldn't want my children going that way either. The path shown is on the route which the second lot that I link to would have to take. It is little over a metre wide, and that's for bidirectional use by bicycles as well as for pedestrians. The road alongside, with no separation from the path at all, has a 60 mph (100 km/h) speed limit. I put the yellow lines on the photo to illustrate a problem caused by inadequate lighting. Instead of proper lights which illuminate the path from above, feeble solar powered LEDs have been put into the surface of the path where the yellow dots are. If, after dark, you ride between the lights, they encourage you to ride as if the dropped kerbs line up. Soon after the installation of these lights, I rode along there on a moonless night and... had my first crash in many years when I hit that kerb ! The other problem with such lighting is that it hides anything else that might be on the path - such as the width restriction (yes, it gets narrower) caused by a bridge a bit further along, branches that might have dropped onto the path and which could get get stuck in your wheels etc. (I should point out that after many complaints, additional LEDs have been installed near junctions. However, they still don't light the path). For all of what is wrong with this, this is in many ways the good bit. When it reaches the outskirts of Cambridge the path disappears and children are expected to "share the road" with cars. School cycle journeys become a problem in the UK because the facilities that children are expected to use are simply not good enough. There is no consideration of subjective safety, and it would seem no consideration of any other kind of safety either ! 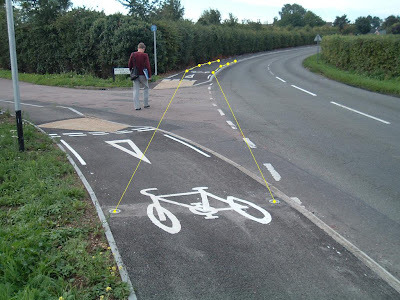 It's hardly surprising that British cyclists worry about segregated cycle provision, and generally prefer to ride on the road even with the 100 km/h traffic, when this is what cycling provision tends to look like in the UK. It's also hardly surprising that only 1-2% of journeys in the UK are by bike, because the majority of the population will never find such conditions to be acceptable. The cycle path is wide and smooth. There is a separate pedestrian path. There are proper lights which illuminate the path. The junctions have lights which give priority to cyclists. The road is quite separate from the cycle path. What's more, on this stretch the road is a through route only for buses, and is otherwise used only for access by residents. There are no fears about letting one's children cycle here, and the result is that they do. At the school my daughter attends in Assen, all the children arrive by bike, including those who live 20 km (12.5 miles) away. This has many advantages. One of our recent visitors commented "I've not seen a single fat child." Also, parents don't have to provide a "taxi" service. Come on Britain, build the infrastructure ! If the infrastructure had been there for the boy in the story he could easily have got to school in under half an hour on his bike. We have more stories about school travel, which you may like to note, doesn't stop in the winter either. The junction shown in the video is on the route of the Study Tour. Read more about issues facing British children and how they compare with their Dutch counterparts. I like the UK solution: Paint bikes on the footpath and that'll solve the problem. Trouble is, when you do that it blurs the distinction between 'footpaths' and bike lanes. I think you're right: this is what makes people (Pedestrians and cyclists alike) protest against bike paths. How did the Netherlands build the political will to actually do this in the first place? And how can we transplant some of that over here? The example on the photo is close to criminal. 100km/h on such a narrow road, no seperation, only one side for cyclists. And those lights in the road is crazy, it is blinding because it comes from the ground. Biking is not a videogame. In Holland it is very simple, road congestions increase every year. If all the bikers start travelling by car, the traffic would grind to a halt. In traffic, a bike takes up a fraction of the space that a car does, the same goes for parking and finding a parking space close to the destination is easier. A bike is smaller and braking distance is smaller. On top of that cycling in the city is the fastest way to get about town. Reasons enough, are reasons not enough? @H@rry - clearly not reason enough, because the same (rising congestion etc.) is as true in the UK and yet only recently has there been even a nod towards encouraging cyclists. And cars treat you as an obstacle, without ever seeming to consider that if the cyclist wasn't on a bike, they'd be in a car and taking up even more of the road. Perhaps the Dutch are just more logical? My take-away from this is that I want to move to the Netherlands now. The bicycle facilities in the US are pretty poor, even in moderately bike-friendly Seattle. In fact, the Netherlands is the only country in the world that has such good cycle facilities. Outside the NL you'll rarely find a similar quality of cycle facilities (perhaps Copenhagen is another good example). Me-How: Absolutely right. Denmark and Germany are actually doing quite well by world standards, but I still don't think what they have there measures up very well against Dutch provision. I've made comparisons on this blog with both Germany and Copenhagen. There's no good reason why other places don't do better. It's just a matter of making a proper start and getting on with it. Britain, unfortunately, tends to produce more hot air than action.